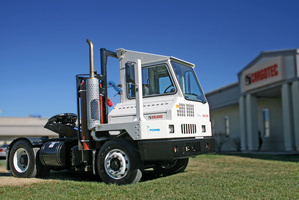 As emission regulations grow stricter and the price of diesel fuel continues to rise, Cargotec is the first to launch a hydraulic hybrid drive terminal tractor offering customers improved performance, significant savings in fuel costs and even greater reductions in nitrous oxide and particulate matter emissions. Paired with the Kalmar Ottawa 4x2 off-highway terminal tractor, the hydraulic hybrid system will initially be available to customers operating in North America. The new machine is the result of Cargotec's partnership with Singapore Technologies Kinetics Ltd (ST Kinetics) and its subsidiary Kinetics Drive Solutions Inc, a leader in the research and development of hybrid technology. The Kalmar hydraulic hybrid drive terminal tractor is equipped with a parallel system that simultaneously transmits power from two distinct sources - the primary diesel engine and the secondary hydraulic motor. The coordination of these power sources maximises fuel economy and satisfies performance constraints. Mikko Vuojolainen, Vice President, Terminal Tractors, says many operational challenges for hybrid systems in terminal tractors had to be addressed before introducing one to the market. "The normal application of a terminal tractor involves many stops and starts where frequent idling and reverse motion is common. This inconsistent use of power makes it difficult to consistently capture regenerative energy. After carrying out extensive testing on a variety of alternatives, it was clear that ST Kinetics' Hy-POWER hydraulic hybrid drive system combined with clean diesel engine technology offered the most benefits to the customer and environment. In this application, energy is only transferred twice as opposed to four times with an electric hybrid." Although fuel consumption with the hydraulic hybrid system can vary depending on driving style and the operational application, in the typical port environment, fuel savings of 20 percent and an even greater reduction of NOx and particulate matter emissions can be achieved. Cargotec has given the new Kalmar hydraulic hybrid drive terminal tractor its Pro Future(TM) rating - adding to the company's expanding portfolio of environmentally friendly solutions. "The pressure to reduce emissions at ports and in urban areas is strongest in the United States. We have engineered the Kalmar hydraulic hybrid drive terminal tractor to help customers meet ever-stricter regulations in this part of the world and to combat expensive exhaust after-treatment solutions." He continues: "In addition to financial constraints, companies operating large fleets of equipment in confined spaces, often near urban developments, can come under significant pressure to reduce their environmental footprint," adds Vuojolainen. "With the number of machines involved in normal port operations, any fuel savings per machine can translate into significant savings when applied to a whole fleet." Besides improving the fuel economy and reducing emissions, a Kalmar terminal tractor equipped with the optional Hy-POWER hydraulic hybrid drive system enjoys significantly smoother acceleration helping to reduce driver fatigue and driveline wear. The machine's inching function also allows the vehicle to advance without engine power, further saving fuel and eliminating emissions altogether. All this combines to make the cost-effectiveness of a Kalmar hydraulic hybrid drive terminal tractor the most competitive hybrid solution on today's market. Vuojolainen believes that customers in North America will appreciate and accept this hybrid solution because of its many benefits. "One remarkable advantage of the Kalmar hydraulic hybrid drive terminal tractor is that the parallel system allows the vehicle to function with or without its secondary power source. This feature further ensures the availability of the machine, not to mention its lack of downtime due to recharging," he says. The configuration of the hydraulic hybrid components allows them to be easily accessed, and they have been built to even outlast the normal life cycle of a terminal tractor. Scheduled maintenance intervals of the hybrid components are twice as long as the regular intervals required to properly maintain a terminal tractor. Furthermore, the hybrid system does not require expensive replacement parts, helping to drive down the machine's lifetime operating costs. Cargotec is committed to providing total support to customers operating with Kalmar terminal tractors equipped with hydraulic hybrid drive technology. Backed by the most extensive dealer network in North America, customers can be sure that their hybrid machines stay productive. Additionally, Cargotec will conduct maintenance and operator training for customers' own personnel helping to further promote better fuel economy and machine reliability. Cargotec has taken an active role in the development of integrating hybrid technology with the terminal tractor application. Involved in multiple hybrid terminal tractor projects, the company delivered one hybrid hydraulic drive machine to PSA Singapore Terminals together with ST Kinetics late last year. Cargotec's drive to reduce fuel consumption and emissions using hybrid technology has been underway for some time. Starting in 2008, the company was the industry's first to offer straddle carriers and later shuttle carriers with hybrid drive systems. The new Kalmar hydraulic hybrid drive terminal tractor featuring improved performance, better fuel economy and greater emissions reduction.